Male flounder like this are bountiful during certain times of the year at Galveston Island, Texas. PREFACE – Good morning Texas Fly Fishers! We skipped right past the Monday Morning Cyber Sidewalk, and into Tuesday – before I even knew what was happening. That’s how it goes with twelve hour shifts out in the Middle again. This is the last entry on fly fishing for flounder. Perhaps I obsess over this, but it is great fun, low stress and a completely unique fly fishing experience. Shhhh, don’t tell everyone, but fly fishing for flounder is just as effective as conventional fishing for flounder. 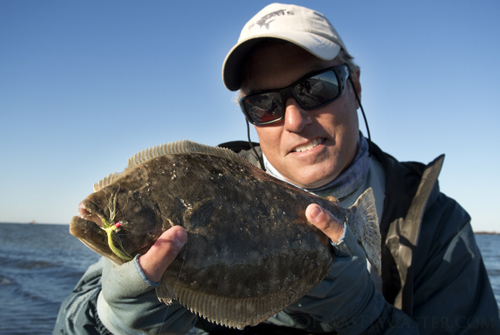 Although the Texas Gulf Coast flounder run really qualifies as a frenzy most times, a free-for-all of all kinds of fishing methods catching flounder in all kinds of ways, there’s some method to what looks like madness surrounding these flounder phenomenon. The grey that matters is between your ears. The Texas Parks and Wildlife Department instituted a special regulation regarding flounder, and it limits your keep to two flounder during one, and only one month – November. Virtually everyone agrees that one change has led to a significant increase in Texas flounder populations. I believe it too. So that’s two (14″ minimum) people can keep per day. October, or December, a fisherman can take up to five with the same length limit. Some strange behaviors have developed because of these regulations, and I am just here to report – because I don’t really understand it. When you drop in to fish a place like the backside of Sea Wolf in Galveston, there may be a hundred fishermen in the water that covers about a half-mile. It’s not shoulder-to-shoulder, but it’s the closest thing I’ve seen in Texas saltwater fishing. As soon as you find your way onto the filthy shoreline, you will be asked, “Do you want some fish?” by guys with stringers of two flounder tied onto the belt of their neoprene waders. My response is a “thanks, but I’ll try to catch my own,” or, “Thanks, but I hope I am good enough to catch my own.” If anyone knows what their motivation is, feel free to clue me in. Some of the flounder were monsters in the 3-4 pound range. I assume this violates TPWD regulations as well. If you have time to spare, the solunar charts are your BEST FRIEND. We had limited time, so we knew we had to fish – regardless of the tides and charts. Distilling it down though, a flounder, in this behavior pattern, comes in on the incoming tide. When I say, “comes in,” I mean comes in to your feet, right next to you. I saw at least three in less than three inches of water within a foot of the shore. If you love nature, it’s a real high, and they don’t always spook because they rely so much on their camouflage. If you have time, do what the locals do, and don’t even bother until the tide begins coming in. I never paid much mind to the conventional (gulp) fishermen and how they set a hook on flounder. I know how they work it, and how they rig it, but until Salas told me, I never knew it was literally a ten-second wait after you feel them take ahold until you set the hook on a flounder. I don’t know about you, but that seems like an eternity to me! What we do when we are fly fishing for flounder is to fan our casts – meaning cover all the water from one position, in about 2-3 feet of water offshore. You can fish the progressive shore slope, or the big sand and mud sand bars. As you fan, spend extra time at your 90-degree (from noon (straight ahead out to deep)) position – close to shore in both directions 3-o’clock and 9-o’clock. We picked up a lot of fish in less than six inches of water this trip. Once your fly hits the water, let it sink. You want to feel it dragging bottom, and you’ll occasionally get hung up – guaranteed. So it’s a long, slow strip … so that the fly is either dragging, or only a handful of inches off the bottom. When you feel the resistance, you’re done! You can give the line a little extra line set, but 19-of-20 times just lifting to fight is all it takes to keep the flounder on. Mine were hooked in the same place, the same way – EVERY TIME. The physiology of the fly and the flounder do all the work for you. If your flounder are getting unbuttoned, sharpen your hook. Once you are hooked-up, remember our lessons from years past – side pressure. This is a flatfish that has maximum pull when your rod is at vertical. Turn a 9-foot rod sideways and the leverage will land your flounder while it’s still green! Remember to keep your leader long. Remember to try different weighted Clousers to see which sink is best. AND, remember to change colors if my tried and true pink over chartreuse doesn’t work. It wasn’t working for me this trip, so I switched to a chartreuse/chartreuse heavy Clouser, and that changed everything. Flounder key on color. I saw it, so you gotta’ believe me. The fact that flounder are some of the best tasting fish in Texas Gulf Coastal waters is unavoidable. I know we fly fishers like to catch-and-release. However, feel free to blame me for your taking a few of these guys home for your table. The way I see it, take the boys and leave the girls. I saw a few females being taken, and that bothers me a bit. There just were not many females that I saw, and our sizes generally from 14-16, nothing between that and males 18-20, and then mammoth females 21 to 25 inches long. Cleaning flounder for fillets, or stuffing, is an interesting proposition. Things aren’t where they normally are on other fish, and instead of two fillets, you get four! There’s also one delicacy that may sound strange – flounder cheeks, which are a delicacy. Well, I hope this series on catching flounder on a fly rod provides enough information, and inspiration to get you out and fishing for these fascinating fish. My main interest in catching flounder on a fly rod is to show that it can be done quite successfully, and I will continue to pursue these fish, trying more methods, flies and patterns that make for successful flounder fishing along the Texas Gulf Coast. I’ll keep you posted. Remember to read previous posts; How to Catch Flounder on Fly Rod Part 1 AND How To Catch Flounder on Fly Rod Part 2. There are at least four more posts from years past – on flounder on fly and Black Friday fishing experiences.